Okay, so picture this predicament: I am an active member of a skeptical activist organization, the Guerrilla Skeptics on Wikipedia team (GSoW), doing public presentations on behalf of the organization. 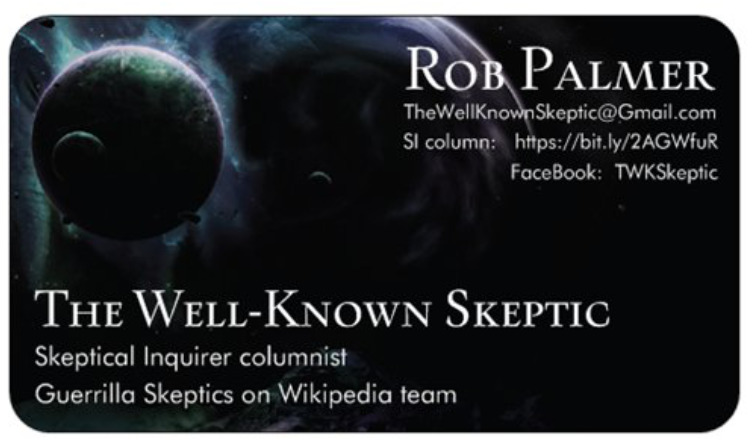 I was just hired by the Center for Inquiry (CFI) to write a (facetiously titled) column, “The Well-Known Skeptic.” I had just created a Gmail account and a Facebook page, also both using “The Well-Known Skeptic.” To top it all off, I had just ordered my first set of business cards with “The Well-Known Skeptic” boldly emblazoned on them. Ouch. What was “The Well-Known Skeptic” supposed to do? Well, write an article on this subject for CFI’s website, of course! On the odd chance that a reader does not know of Sharon, I suggest perusing her in-depth Wikipedia bio (which GSoW had a hand in writing). A short summary is that she is a geologist and science writer with a focus on the paranormal, pseudoscience, and anomalous natural phenomena. She ran the Doubtful News site (recently terminated), the Spooky Geology website, and is the producer and cohost of the 15 Credibility Street podcast. Sharon has written for The Huffington Post, and also wrote the Sounds Sciencey column for the CSI website, where her bio identifies her as “a scientific and technical consultant for the Committee for Skeptical Inquiry.” She also has presented at numerous conferences, including TAM, NECSS, and Dragon Con. Sharon recently had her first book published, Scientifical Americans: The Culture of Amateur Paranormal Researchers. Several people have asked me to explain why I now reject “Skeptic” to describe myself. In short, the label is limiting and is overwrought with mistaken assumptions of being elitist, arrogant, and closed-minded. Unfortunately, being labeled a Skeptic sends a signal to some to tune out what I might say by default because of the association with having a dismissive, know-it-all attitude, defeating any efforts at meaningful exchange over questionable claims. I hope I see the day when skepticism gets a reboot and catches on with a public tired of lies, scams, and nonsense. Until then, I continue to be skeptical as warranted, but please don’t call me a Skeptic. I don’t think we need a term. The term lately refers to the something other than the process of skepticism. Like I said, I still practice the method because it works but I don’t need a label to define my views. Labels and categories are artificial and often get corrupted. Let your words and behaviors define you instead… But be assured, as I said, I will continue to do what I have been doing, just without a tag that I and others perceive as a pejorative label. …This whole piece revolves around mistaken assumptions that observers make. One problem with much of the discussion between skeptics and believers has to do with semantics. Just using the terms “skeptics” and “believers” is limiting and mistaken in many ways. But, I feel I have no choice to use these terms to make this piece reasonably understandable. I am completely aware that this is problematic and I ask that you see this as a panorama, not as sticking people in labeled boxes. But I do think we need a term … a label. The fact is that things, and groups of people, get labeled and categorized because that is the way humans think and process the world around them. Labels are necessary as shortcuts to avoid giving lengthy explanations whenever something is mentioned or discussed. What about discarding a label with the goal of using an alternative, because the original has acquired negative connotations? This has historically proven to be problematic (think Brights as a replacement for Atheists). On the other side of the coin, gay folks proudly and successfully fought to reclaim a former term of disparagement, queer. Perhaps atheists as well as some skeptics need to take a lesson from that. Alright, the bottom line is that I respectfully disagree with Sharon on this point. I believe dropping the label “skeptic” is not a workable path forward. But, being a skeptical movement newbie, whose opinion will matter very little on this subject, I was determined to ask some skeptical veterans for their take on this subject. As it turns out, I had it on my near-term schedule to interview two other skeptical podcasters: Celestia Ward, cohost of Squaring the Strange, and Jay Novella of The Skeptics’ Guide to the Universe. In the August 31 episode of Squaring the Strange, “Skeptical Burnout,” Celestia and her two cohosts, Ben Radford and Pascual Romero, discussed these very same topics at length and even mentioned a prior “appearance” of Sharon on Squaring talking about this subject. (This segment was actually recorded prior to Sharon’s July 10blog post, so it was not mentioned.) The “Burnout” episode is available here, and the relevant discussion starts at 40:45. In 2018, Hill publicly eschewed the “skeptic” label due to perceived negative connotations of the term and issues she has with organized skepticism, however she maintains her support for the philosophy and process of scientific skepticism. This entry at the very bottom of her bio article causes Sharon to be listed on the category collection page for American skeptics under “H.” Her name appears on that page with a diverse set of folks whose only commonalities are that they are (or were) Americans and share (or shared) a skeptical viewpoint. These people include: Harry Houdini, Ray Hyman, Sam Harris, Harriet Hall, Britt Hermes, and George Hrab. Sharon appears in this list along with such skeptical luminaries as Isaac Asimov, Robert Todd Carroll, Richard Dawkins, Carl Sagan, and James Randi. And what about Sharon’s work? If she is personally eschewing the skeptic label, does that apply to whatever she creates with skeptical content? Wikipedia has a List of Skeptical Podcasts. And guess what is listed there right at the top, in the company of The Skeptics’ Guide to the Universe, Skeptoid, and The Skeptic Zone: Sharon’s podcast 15 Credibility Street. If I removed her podcast from this list, where else could it be listed? Nowhere. There is no Wikipedia article called “List of Skeptical Podcasts Hosted by People Who Don’t Want to Be Called Skeptics.” The only mention of this podcast within the encyclopedia would be in Sharon’s own article, making it much harder for someone to stumble across while looking for a new skeptical podcast to check-out. That seems like a bad thing … for both Wikipedia and Sharon. Now, I could make edits to modify all of these things and more, but frankly I don’t think I could justify this action to other Wikipedia editors. Everything on Wikipedia is done by consensus, and follows strict rules. With over 6,200 Wikipedia edits thus far, and thus being classified as an “Experienced Editor” (a label! ), I have a realistic understanding of what should or should not be changed according to the standards of the encyclopedia. I believe I have already gone as far as I could to honor Sharon’s “Don’t call me a Skeptic” request, without having to face valid pushback from the other editors. Regarding some of her other points: the Skeptical community is much more diverse now than it’s ever been. At NECSS 2018 we had more than 50% female speakers, and our MC is a woman (Leighann Lord). Our community may have been started by white men but it’s grown past that. The Skeptical community is similar to other communities … . There are misogynists in every community. You get enough people together, and a percentage of them are going to [misbehave]. But there’s nothing particular about the Skeptical movement or the science movement that makes us different from any other community. When [Sharon] says “I’m moving on. I’m backing away out of the Skeptical community …”, I interpret that as her saying “I’m turning my back on people who I share a world view with.” I look at it like this: this is my community for good or bad, and I’m trying to make it better. I am doing everything I can to educate people and make them better Skeptics so we collectively can change the world. I think her heart is in the right place. But I think the body is doing the wrong thing. I wouldn’t recommend anyone abandon the word “Skeptic” because you will end up being branded with a new word that you didn’t choose, or you will be referred to as a skeptic anyway. If a person or a group were able to re-brand the movement, the reality is that whatever word was picked, it would end up with the same baggage, and have the same feel, as the word “Skeptic” does today. I am going to leave it at that. After many years of experience in the movement, Sharon has thought this through, come to her own conclusions, and made a public proclamation. She feels she is right and can obviously do whatever she wants regarding this subject. But I believe that if you discard a label there are only two paths forward: you try to not be associated with one at all or you attempt to adopt a new one. I have expressed my belief that neither strategy will work. So, for me, until a clearly better and workable option comes along, I’m keeping my skeptic’s card. Acknowledgements: For significant input with the details of this article, I am very grateful to Paula Serrano and Diane Palmer.